One of the major challenges for me last year at this time was deciding what to pack for the upcoming season in Sweden. After all, we would be arriving August 1, spending the remainder of the summer, all of the fall, all of the winter, and the beginning of spring- nearly an entire year- in Europe. How the heck was I supposed to pack for an entire year in Europe in one large suitcase (under 50 pounds, unless you pay extra charges for overweight bags), one carry-on suitcase, and my purse?! I know a lot of women in my position have been able to bring more than this- however, Nick and I were already going to have pretty full hands as far as luggage goes! We each had one large suitcase and a carry-on, in addition to a hockey bag and stick bag (each jammed full with 50 pounds of gear or sticks between the two of us). With just 7 weeks until we leave Minnesota, I feel much more comfortable and prepared to pack for our upcoming year in Sweden. 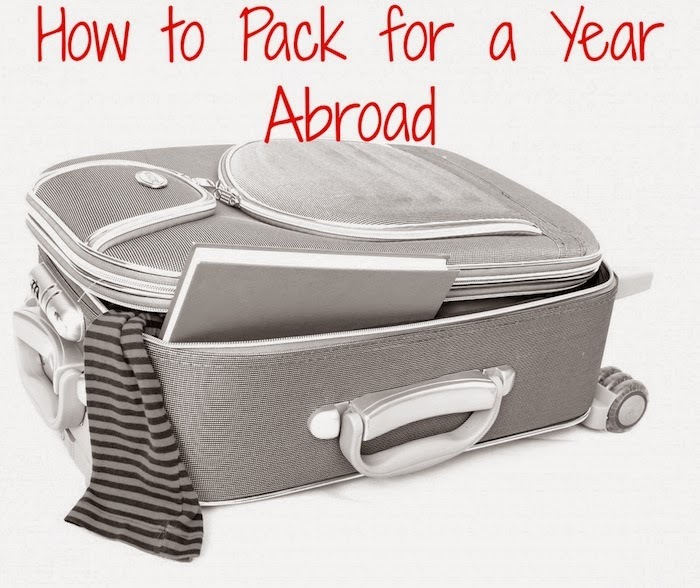 Here is a long list of everything you will want to pack, or at least consider packing, if you will be spending a year abroad. Circumstance- what will you be doing over the next year, and is this item appropriate? For me, this meant- my husband will have practices/games almost every day, and be away frequently. I probably don't need 12 nice going-out dresses. Some extra workout clothes (that double for the gym, or lounging around) are a good bet! Weather- again, but what will the weather be like? How long will you need cool summer clothes and shoes versus warm layers for the winter? Convenience- How easily can you find this item in Europe, and is it an item you can take some time to find or will need immediately? Cost- What will it cost if you buy the item at your destination? Personal Preference- What is your personality? Are you a makeup girl, and need the latest trends? Are you a shoe girl, a purse girl, whatever type of girl there is? Think about who you are and what you value the most- and bring that. The US (on average) tends to be cheaper than Europe for a lot of these items, so pick which ones you really need and love, and leave the rest at home. After all, you will only be gone for 8-9 months, in all reality! Slingbox- truthfully, this is not an item that you technically pack, but one you should invest in before your time abroad. The slingbox connects to your TV cable box at home, and you can then play it live via sling player. So useful when you are wanting to watch live sports, etc while abroad! Apple TV- can go hand in hand with Slingbox. You simply hook the Apple TV to your TV, and can then live stream anything you'd like from your computer/phone/iPad to the TV via wifi. External Hard Drive- again, hand in hand with Apple TV. You can get a pretty small external hard drive that fits just about anywhere that will hold 1 TB of data. I'm fairly certain that the hard drive we have currently has over 100 full seasons of TV shows, and 500 movies. Plug that in to your computer, and you can play anything you'd like on your TV! Medicine- anything and everything you may want over the next year. For us, this meant ibuprofen, cold flu & sinus pills, Neosporin, allergy medicine, and my birth control. Personally, the last thing I want to deal with when I am sick is having to run out and buy medicine- especially if that medicine label is in another language, or I can't even get it without a doctors appointment! Vitamins- Much more comfortable to go with the brands you know & love from home! Pizza cutter- seriously, the pizza in Sweden tends to come as a whole pie. Unless you feel like performing a constant battle with your pizza, throw in a pizza cutter for good measure. Reusable grocery bags- if you have a particular favorite! I love the bags from Lunds, because when you are not using them they fold up nicely and clasp together. When bagging groceries in Sweden, you either have to purchase paper/plastic bags, or use reusable bags. Definitely go the reusable route- you can save a ton of money (and the environment). Truthfully, I'm not going to say too much on the clothes to pack. We are girls- we know what clothes we will wear. I wear jeans & t-shirts almost every day, and layer those with sweaters, cardigans, and scarves- so this was the majority of what I packed. I would say to bring more workout clothes than you anticipate needing- I was surprised by how much I was able to hit the gym and that these were the clothes that got used the most. I had brought plenty of clothes and dresses for going out, and really didn't use these all that often- with the boys' schedule, you simply won't be hitting the town every weekend. Same thing with swimsuits- I brought 4 last year and have no idea why, as I wore exactly one of them. For me, the majority of my time was spent in a hockey rink. With that in mind, each item I pack for Sweden is likely going to be something that will be worn to the rink and help keep me warm while I am there. Of course, there will be a few dresses and other such items that I will pack for the nights when we do have events, but otherwise I am going to be packing with the hockey rink in mind. Cell phone- make sure it is unlocked! Hair styling tools- just buy these while you are there! The majority of US tools are only the correct voltage for the US- while you can use adapters, is a surge really what you want to risk? I was able to buy a blow dryer and curling iron for a reasonable price. One benefit of buying this items in Europe is (if applicable) is that you can leave them in storage over the summer, and not worry about hauling them back and forth. 95% of those summer dresses you are going to pack. Along with those wedges. Last year, because I was packing in the middle of July, my mind was full summer mode and I packed as many summer dresses and wedges as I could fit. Unfortunately, these were only good for really the first month- after that, Sweden cools down considerably! Take one or two dresses, bonus points if you can wear them with tights & sweaters in the winter, and call it good. Measuring cups- Originally, I had been planning on bringing these. Turns out, you get pretty good at the metric system pretty quick, or you can just convert your recipes. Bedding. Really, for us hockey ladies, the team will provide you. For other world travelers, just make a quick trip to Ikea- chances are, you will anyways!- and you will be set. As long as you are OK with having super cute (notice the dry, dripping sarcasm) bedding, Ikea will suffice. I can't stress how much the WEIGHT of your checked bag is key. I already said, my checked bag was only half-full before the weight was at the max. With this being said, before you place an item in your bag- make sure you really need it, will love it, and will use it for at least its weight in gold. Because thats what each item should be worth, is its weight in gold- especially if you are only allotted a small 50 pounds. While packing clothes, really think about what seasons you will be there for, and how you can potentially layer various articles of clothing to stay warm year round. I was fine with one main jacket last year, due to the ability of being able to wear a tank, sweater, and scarf with that jacket. Layering is key! Regarding credit cards, if you've never been abroad you may want to let your company know you will be so they don't put holds on your account. Make sure to check if there are foreign transaction fees. The Delta Amex recently switched to having no foreign transaction fees, which is a huge bonus for myself! Feminine products. Not going to lie, finding plastic applicators last year- went to about 6 different places. Don't wait, bring at least a small stash- and find what you want before necessary! Liquor drinker? Bring one of your favorite bottles. Liquor is extremely expensive in Sweden, so grab a bottle duty-free, or check one into your checked bag. We brought two nice bottles of Scotch as gifts, and were able to save a ton of money by purchasing them ahead of time. I'm a beer & wine drinker, so we didn't need anything special for me! For items that you will wear a lot, such as socks & underwear, unless they are brand new replace them before you go. About two months into the year is when all of my socks decided to wear out- and purchasing them for 4-5 times the price hurt! They will wear out eventually, so just replace them ahead of time. Plus, then you get the brand-new feeling! My last final side note- make sure any items that are a must-have within your first 48 hours are in your carry-on. Something will be lost. I wish I could be an optimist on this, but something will be lost. Last year, after checking 4 bags, only 2 of the bags made it to our final destination. Fortunately for me, one of those bags was mine. Unfortunately for Nick, his bag did not make it (then again, being a guy, it mattered to him much less than it would have to me). The hockey equipment made it, while the stick bag did not. Both lost bags showed up within 3 days! And that is everything I can think of! Packing my carry-on was quite a different story- for a list of what I travel with, check out my post from our 26-hour travels to Thailand. Fortunately, anything you need and may not pack can either be purchased in Sweden, or shipped over to you by a loving family member. Anyone have must-haves for packing for a year in Europe that I missed?